Newborn photography, like anything else, has specific styles and methods that are popular among photographers. Right now, there are two main styles that most photographers fall into - Studio (posed) and Lifestyle (at home, not posed). My take on newborn photography is a little bit different.. because I kind of mix the two. Newborn babies are placed in different positions and styled using props and wraps. Sometimes images are composited due to safety concerns and baby typically has to be asleep for the process. The final result is beautiful stylized artwork. A casual photoshoot where the photographer comes to the client's home. Using available light, candid images are captured in an environmental setting. The final result is set of photographs that tell the story of the baby at home with family. I mix the comfort and control of a Studio environment with a lifestyle non-posed feel. Baby can be asleep or awake, held by parents, or swaddled. The final result is a bright and simple image where the baby and parents are the focus of the artwork. One of the biggest benefits of Studio photography is.. the Studio. You get a comfy warm place that is dedicated to your photoshoot, with everything already arranged and in the right place. It's super easy because all you have to do is show up with your baby and a few other items (like clothing to wear in the photos), and that's it! And speaking of clothing, a big focus for me is the wardrobe styling. It's important that you look and feel great in what you're wearing, but that it's also timeless (as in, not too trendy) and photographs well. When you have a new baby, picking out what to wear is the last thing you'll want to worry about. The other thing that's included with every session is professional hair styling (with the option to upgrade to a dedicated hair/makeup artist on site), which means you don't have to trouble yourself with looking perfect before your session, either... it's all taken care of! There is nothing wrong with newborn photography that utilizes props and poses for the baby, it's simply not my thing. I personally feel that a simpler approach to newborn photography will stand the test of time and will look just as relevant twenty or thirty years from now as it does today. When I look at baby photographs from 50 years ago, there are no props or setups. It's usually just the child, dressed in a simple white outfit, sitting on floor or being held in his Mother's arms. It's all about the baby, and I think that's wonderful. Those are the kinds of images that I can see being framed on the wall, and admired for many years to come. I don't pose babies, so newborn portraits can be done at any time during those first few months after the baby's birth (posing typically requires the baby to be younger than 10 days). This often is the difference between parents getting professional photographs of their newborn or not. I frequently photograph babies around the 4-week mark, sometimes even later.. because things happen that you can't predict beforehand. The photo session date isn't set until after the baby arrives for that exact reason. And if you need to reschedule at the last minute, that's not a problem either. I know (trust me, I KNOW) that the last thing you'll want to do after giving birth is to get in front of the camera. But let me tell you why it's important. 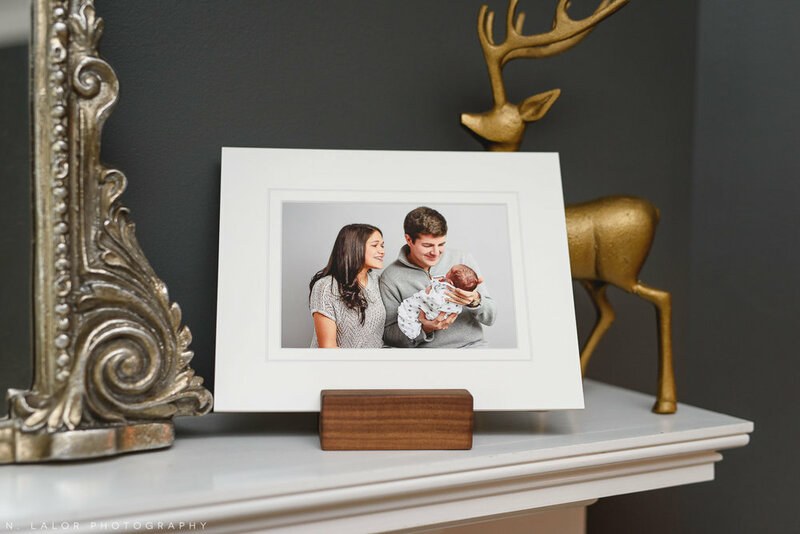 Your baby will want to have photographs of her parents. She will want to know how small she was in your arms. She will want to see that look of absolute love and adoration on that every parent has for their baby. And it won't matter to her that you still had that baby weight or that you looked rightfully tired (this, btw is also where Photoshop comes in). A professional photoshoot is a fantastic opportunity to do this and it's the reason why hair and wardrobe styling are such a big part of the process. If you're hiring a professional photographer, spending a whole lot, and are walking away with a USB with digital files, you're not getting your money's worth. Photographs are simply not finished until they are printed. And most people don't have the time to research, design, and order prints or albums of their images. But it's not enough to just print the photos, you really want them printed on archival photo paper using inks that will last. There's a reason why the consumer photo printing is typically so cheap and professional photo printing is expensive. As for me, I individually print every photograph on my own professional pigment ink printer using Hahnemühle fine art paper (and every print gets a 4-ply mat, too). It's one of the most expensive ways to present photographic work.. but there is nothing else that compares (it's how museums and galleries do it, after all).. and once you see the difference, you'll know too.